This article is about the town. For the village, see Stillwater (village), New York. Stillwater is a town in Saratoga County, New York, United States, with an estimated population of 8,547 in 2016. The town contains a village called Stillwater. 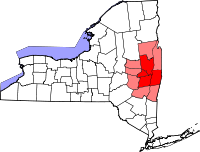 The town is at the eastern border of the county, southeast of Saratoga Springs and borders both Rensselaer and Washington counties. Saratoga National Historical Park is located within the town's limits. There is a hamlet in Minerva, Essex County, New York with the same name which has nothing to do with this town. Stillwater was established as a town in 1791, when Saratoga County was formed. In 1816, the hamlet of Stillwater incorporated as a village. In 1859, Mechanicville became the town's second village. The Stillwater Free Library was established in 1949 by Barbara Alexik and Elizabeth Beiter in the building formerly home to the St. John's Episcopal Church. The Stillwater United Church was listed on the National Register of Historic Places in 2006. According to the United States Census Bureau, the town has a total area of 43.6 square miles (112.8 km²), of which, 41.4 square miles (107.1 km²) is land and 2.2 square miles (5.7 km²) (5.07%) is water. 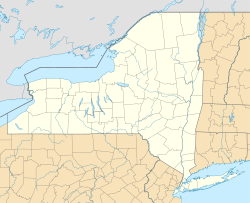 The east town line is the border of Rensselaer County and Washington County, marked by the Hudson River. US Route 4, partly conjoined with New York State Route 32 follows the Hudson River through the town. New York State Route 423 is an east-west highway in the northern part of Stillwater. New York State Route 9P is a north-south highway in the northwestern part of the town by Saratoga Lake. New York State Route 67 runs along the south town line. At the 2000 census, there were 7,522 people, 2,786 households and 2,109 families residing in the town. The population density was 181.9 per square mile (70.2/km²). There were 3,054 housing units at an average density of 73.8 per square mile (28.5/km²). The racial makeup of the town was 98.21% White, 0.41% Black or African American, 0.11% Native American, 0.47% Asian, 0.01% Pacific Islander, 0.11% from other races, and 0.69% from two or more races. Hispanic or Latino of any race were 0.62% of the population. There were 2,786 households of which 38.0% had children under the age of 18 living with them, 60.7% were married couples living together, 10.0% had a female householder with no husband present, and 24.3% were non-families. 19.5% of all households were made up of individuals and 7.7% had someone living alone who was 65 years of age or older. The average household size was 2.70 and the average family size was 3.10. 27.0% of the population were under the age of 18, 6.9% from 18 to 24, 31.9% from 25 to 44, 23.5% from 45 to 64, and 10.7% who were 65 years of age or older. The median age was 36 years. For every 100 females, there were 99.8 males. For every 100 females age 18 and over, there were 96.8 males. The median household income was $47,579 and the median family income was $53,023. Males had a median income of $37,428 and females $27,257. The per capita income was $19,291. About 5.3% of families and 6.7% of the population were below the poverty line, including 8.6% of those under age 18 and 11.3% of those age 65 or over. Students attend school at Stillwater High School. The school is located in the village of Stillwater and serves grades K to 12 in two buildings. Lemuel Roberts, American Revolutionary War soldier and historian lived in Stillwater as a boy in the 1760s. Bemis Heights – A hamlet by the Hudson River, north of Stillwater village on US-4. Brown's Beach – A hamlet in the northwest part of the town, by the south end of Saratoga Lake on NY-9P. East Saratoga Junction – A location in the south part of the town. Ketchums Corners – A historic location in the northwest part of the town, near Saratoga Lake. Saratoga National Historical Park - A historic park in the northeast part of the town. Snake Hill – A hamlet in the northern part of the town near Saratoga Lake on NY-9P. Stillwater – A village located by the Hudson River and US-4. Stillwater Junction – A hamlet in the southeast part of the town on County Road 75. Wayville – A hamlet by the north town line on County Road 70. Willow Glen – A hamlet by the south town line on NY-67. ^ "Town History - Town of Stillwater". www.stillwaterny.org. ^ Roberts, Lemuel (1809). Memoirs of Lemuel Roberts. Anthony Haswell. Wikimedia Commons has media related to Stillwater, New York.